This morning I noticed (because others were retweeting) a tweet from Mark Leiser who claimed that he was threatened with denied boarding by easyJet after making a negative tweet about the company at the gate. It was a remarkable claim and hard to believe. There are two things to ponder here. One was why a company would be so foolish as to try to prevent a ticketed passenger from boarding a flight merely because of a tweet it disliked. 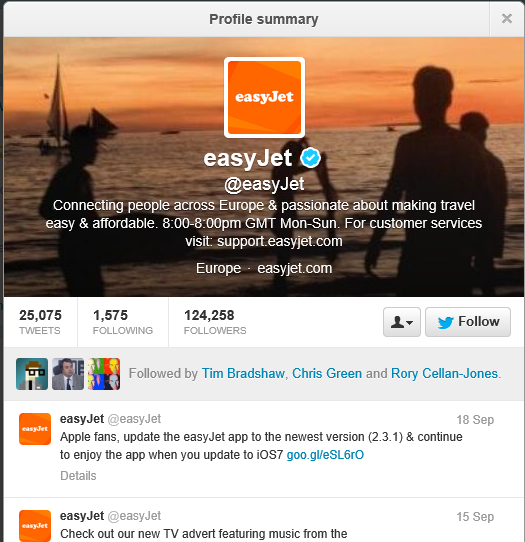 The other was the mechanism by which easyJet saw the tweet, connected it to the passenger, and took immediate action. Is easyJet really monitoring all our tweets and cross-referencing against passenger lists? Further, if such a mechanism existed, it would presumably be for the sake of improved customer service. Now, you need to read this statement carefully; it is not quite as bland as it first appears. Note that the company will not comment publicly on any individual passenger. However, my understanding is that the tweets were part of a wider altercation. The passenger’s original complaint, incidentally, related to easyJet’s alleged refusal to compensate another passenger who would miss his connection (train?) because of a 90 minute flight delay. No doubt easyJet has strict policies on what it will and will not do to compensate passengers after delays and regulations also apply. I have no idea of the rights and wrongs here, but it would not be unreasonable to assume that a vocal discussion ensued and that easyJet’s knowledge of what was being tweeted arose out of it. Does that mean that businesses are at the mercy of customers who are on social media? In the balance of power between customers and big business, a shift towards the customer is in my view an excellent thing; but it is still important to hear both sides of the story. It is unfortunate, perhaps, that in this case a policy of “no comment” on individual cases means (at the time of writing) silence from which readers may well assume the worst. How then do businesses ensure that at least a balanced view of incidents like this are heard on social media? I am not sure that I have the answer, except to give some credit to the wider audience to use common sense and their existing knowledge of a company (easyJet actually has a good reputation among the no-frills budget airlines) to conclude that 140 characters is unlikely to tell the whole story. Update: for a fuller account from Mark Leiser see here.